The iPhone 4 is officially out and with it, Apple’s $5 iMovie for iPhone—a pocket-sized movie-editing application that allows you to create polished movies directly on your iPhone 4. (Earlier iPhones, the iPod touch, and the iPad are not supported.) I’ve had a couple of hours to play with iMovie for iPhone and these are my impressions. 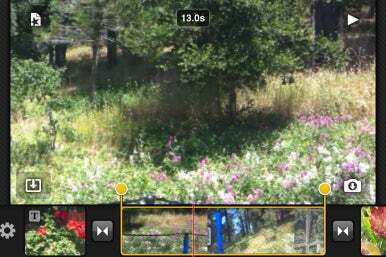 iMovie can use videos you've shot with your iPhone. When you first tap the iMovie icon, you’re presented with a Projects window that reads “Tap + to start a new project.” Tap the Plus button in the upper-right corner of the screen and the screen slides to the left to reveal an empty viewing area that takes up the top half of the screen and a Select Themes sheet where you choose one of five themes—Modern, Bright, Travel, Playful, and News. You don’t have an option to create a project without choosing a theme. (However, if you want to go "theme-less" don't add any titles or stray from the default cross-dissolve transition. 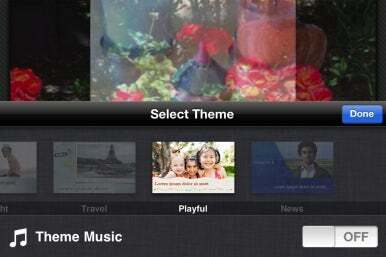 Themes are reflected only in titles and optional transitions and background music.) At the bottom of the screen is a Theme Music entry with an On/Off toggle switch. Switch it on and a music bed associated with the theme you choose is automatically added to the project. Tap Done and the viewing area displays a “Tap [Down arrow] to insert media. Tap [Camera Icon] to record from camera.” When I tapped the Down arrow, iMovie displayed, by default, the video contents of the phone’s Camera Roll. From this view you can also choose photos and audio—using the Photos and Audio buttons at the bottom of the screen that sit beside the Video button. iMovie doesn’t seem to provide a way to import movie clips that weren’t captured on the iPhone. For example, you can’t import video that appears in the iPod app’s Videos area. And while you can add video clips to iPhoto and sync them to the phone, they aren’t available from within iMovie (though they do appear in the Photos app). To insert a video clip, tap the Video button if it’s not already selected and then tap the clip you want. You don’t have the option to trim the clip before you import it. Rather, it drops into a timeline at the bottom of the screen. Once in the timeline you can use the stretch gesture to zoom in on the clip, thus making it easier to make finer selections. To make those selections, just tap the clip in the timeline and orange handles appear at the beginning and end of the clip. Drag one of these handles to trim the clip. As you drag, you see a preview of the video in the preview area along with a small time readout, showing you the length of the clip—13.0s, for example. You can trim only the beginning and end of a clip, there’s no way to split clips, though you can fake a split by trimming the back end of the clip, importing another copy of the clip into the timeline, and then trimming the front of the clip. Trimming is non-destructive. If you’ve trimmed a clip, quit the app, and return a couple of days later, you can restore the footage you trimmed. Use handles to trim the beginning and end of a clip. Importing photos works similarly. Tap the Photos button, choose an album of photos you’ve synced to the phone (or the iPhone’s Camera Roll), and tap the image you want to import into the project. The Ken Burns effect is applied to photos and there’s no option to turn it off. To adjust the start position of the effect, tap the image to bring up the editing controls. Drag the image to the position where you’d like it to start and then pinch or stretch it to zoom in or out. Tap a Start button that appears in the upper-left corner of the screen and then reposition the image and, again, pinch or stretch it if you like. Tap Done and the effect is complete. When you play back the clip, it pans and zooms from the start to end position. If you don’t care for this effect, just set the same position and zoom for both the start and end points. The Ken Burns effect seen through iMovie. 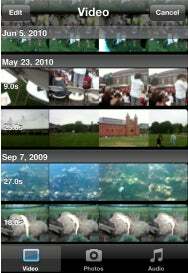 When you add video clips or photos to the timeline, transitions are automatically inserted between each item. By default, this is a cross dissolve transition. Tap twice on one of these transitions, and you bring up a Transitions Settings sheet. On this sheet, you can choose no transition, cross dissolve, or theme. The theme effect is a special effect designed specifically for the theme you’ve chosen. Within this sheet, you can also choose the length of the transition—0.5, 1, 1.5, and 2 seconds are your options. Tap a Done button and the sheet disappears. You can just as easily add a music bed to your movie. When you tap Audio, you see the option to choose tracks from Theme Music (five tracks are included) and tracks from your iPod library—Playlists, Albums, Artists, or Songs. When you choose a track it appears as a green bar below the timeline. There’s no option for repositioning the audio clip, so it appears after the video has started nor can you trim it. When you add a music track to your project, iMovie automatically ducks the music’s volume so that it doesn’t drown out a clip’s audio track. Importing live video into an iMovie project. You can also add live video to your project. To do so, tap the camera icon on the display; the iPhone’s Camera interface appears. Just as with the Camera app, you can choose to shoot video or stills, choose the front or rear camera, and adjust the flash. Tap the red Record button to start recording. Tap it again to stop recording. 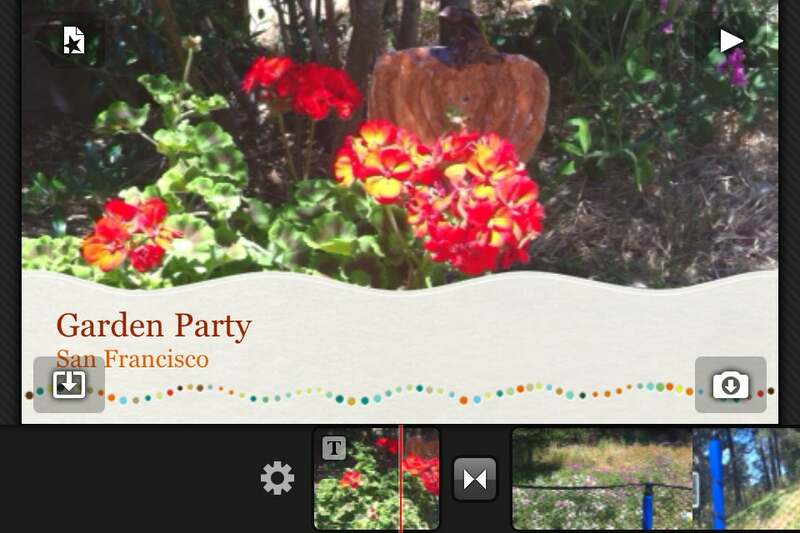 You can then preview the clip, retake it, or tap a blue Use button to insert the video or still into your project. To play a clip, just tap a Play button in the upper-right corner of the display. The video will play from the current position of the playhead. If you’d like to delete a clip, just drag it from the timeline to the preview area, and it will vanish. (iMovie also provides a Delete Clip button if you double-tap a clip.) And you can rearrange the order of clips by dragging a clip to a new location in the timeline. In the Mac’s version of iMovie, you move the playhead to specific places within a clip. In iMovie for the iPhone, you drag the timeline (or within the preview area) so that the point you wish to see appears directly beneath an unmoving playhead that sits in the middle of the timeline. As you drag your finger, the preview area scrubs through the video. At any time, you’re welcome to change the project’s theme. You do this by moving to the beginning of the project and tapping a Settings button. Do this, and the Select Theme sheet appears where you can choose one of the five themes as well as switch theme music on or off. 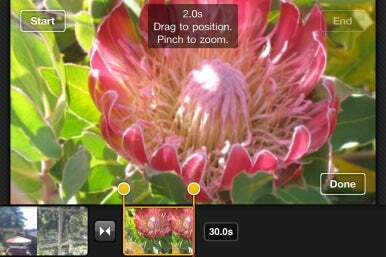 iMovie lets you assign titles and locations to a clip. To do this, double-tap on a clip in the timeline and a Clip Settings sheet appears. This sheet contains a title field and three options—Title Style, Location, and Audio. They work this way. When you tap Title Style, you have the option to assign an opening, middle or ending title to a clip. So, for example, you can assign an opening title style to the first clip in your project (“Aunt Betty’s Birthday,” for example), a middle title style to the seventh clip in a 15-clip project (“The Cake,” for instance), and an ending title style to the very last clip in the project (“Betty Waves Goodbye”). To enter text for the title, just tap in the Title field and type in your text. You don’t have an option to choose a specific font—fonts are associated with their themes. The Location option lets you add a location for the clip in a title. If the clip wasn’t geotagged, you can add a location by tapping the Location entry and then, in the resulting Location sheet, tapping an Other button.You can then enter the location of a reasonably-sized city near the location. Alternatively, you can tap on a title field (which looks very much like a button) and enter any text you like. This is helpful when your location isn't in iMovie's city database. And the Audio On/Off toggle lets you switch off a clip’s audio. You might choose to do this if you’ve recorded a street scene but don’t wish to include the traffic noise. When you’re happy with your project you save it by tapping the Projects button in the upper-left corner of the display. Your project appears in the resulting Projects screen. Tap the Export button in the lower-left corner of the screen and you see the three export options—Medium - 360p, Large - 540p, and HD - 720p. When you tap an option, iMovie exports the project and saves it to the iPhone’s Camera Roll. Once the movie’s in the Camera Roll, launch the Photos app and you can then choose to email your movie, send it via MMS, send it to your MobileMe gallery, or send a copy to YouTube. And, as with other movies you shoot with the iPhone, you can import your movies to your computer when you next sync the phone. These are just the ins and outs of iMovie. I’ll now turn my attention to how it feels to work with iMovie and whether it makes sense to edit video on a phone or simply wait until you’re near a computer. 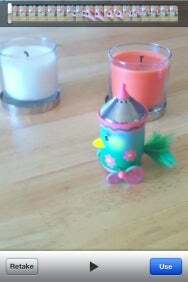 Look for those observations in our upcoming review. 6/24/10 7:30 PM Updated to correct information about manually entering location names.